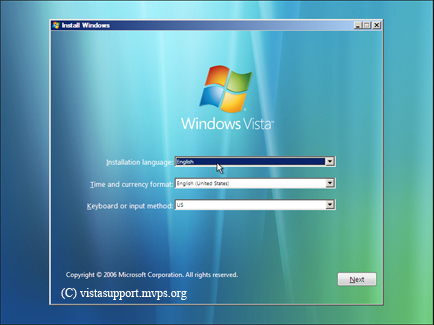 While Windows Vista is a completely new operating system, how you install or re-install is not much different to other versions of the Windows operating system. The most important thing is to make sure you have everything to hand before you actually make a start. You certainly don't want to be having to search around for SATA drivers and things like that just after you have started the installation process. Another important thing to remember is, if you have USB peripherals attached to your PC, i.e., Printer, Webcam, Card Reader, Modem etc, make sure that you disconnect them from the PC prior to installing the operating system. The only USB peripheral you do not need to remove is USB Mouse and Keyboard. 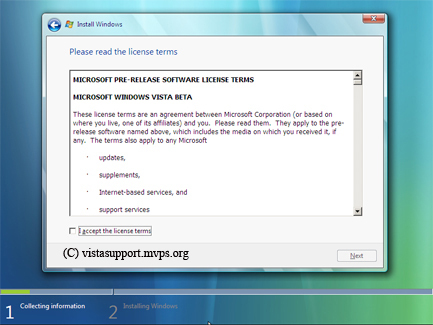 Any relevant drivers; this is not always the case as Windows Vista does have many drivers on the DVD. 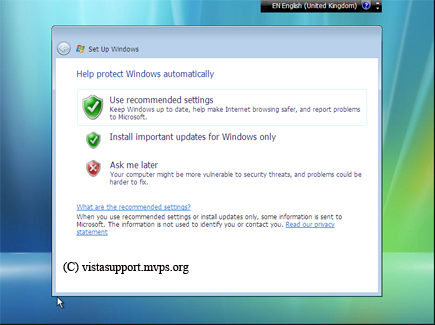 However, it may be necessary to update the driver that Windows Vista initially installs. be particularly aware of Modem drivers. 2/ As the system starts to boot quickly insert the Window Vista DVD. 3/ If all goes well a black screen should appear with the words Press any key to boot from CD or DVD. If you find that the PC boots into Windows XP then you probably weren’t quick enough inserting the DVD into the DVD drive. Don’t worry, just let XP load, then click the Start button and select ‘restart’ and go through the procedure again. 4/ After you press Enter or 'any key' Windows will start to load files into memory. 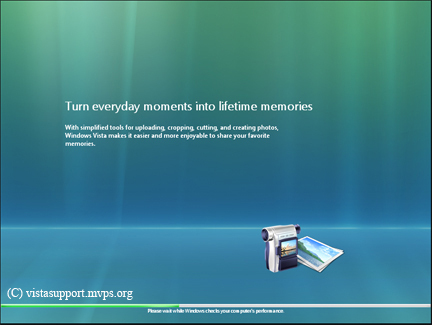 5/ Depending upon the available physical memory in your PC you will find that it takes a few minutes to initially load the Windows Vista files into your PCs memory. 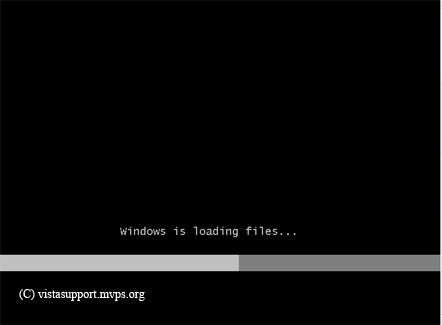 6/ After the main files have finished loading a black screen will appear with a green progress bar. 7/ A short time later the progress bar screen will change to a blue screen like the one above. 8/ When the language Window appears select, using the drop down menu, the language you need for installation and then press the Next button. 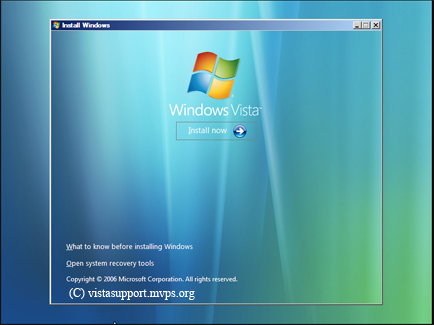 9/ At the Install screen, click the Install Now button to start the installation of Windows Vista. 10/ After clicking the Install Now button, you will be asked to wait. 11/ After a moment or two the product key screen will appear. 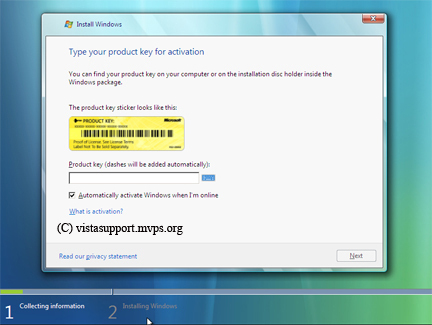 At this point type in your Windows Vista product key number and then click the Next button. 12/ The next step is to accept the EULA (End User Licence Agreement). Just click in the box next to the I accept the license terms option and press Next. 13/ You are now asked to choose the type of installation you require. If you are doing a clean install, select Custom. 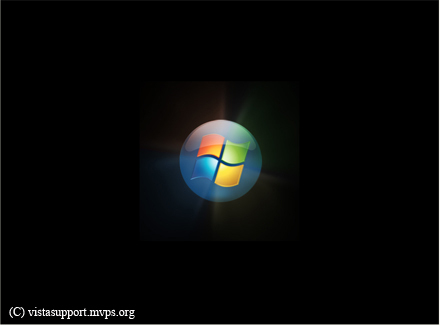 If you are upgrading from another version of Windows, click Upgrade. 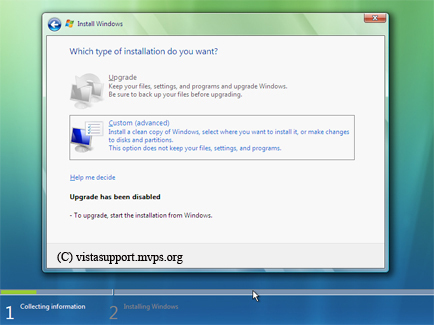 You should note that, if it is not possible for you to upgrade i.e., you are doing a clean install, the upgrade option will be disabled (grayed out). 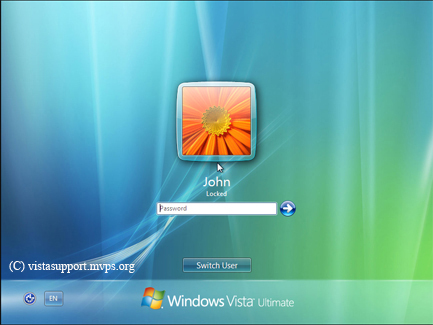 14/ Having got through the preliminaries you now need to select the drive or partition where you want to install Vista. Once you have selected the drive or partition press the Next button. 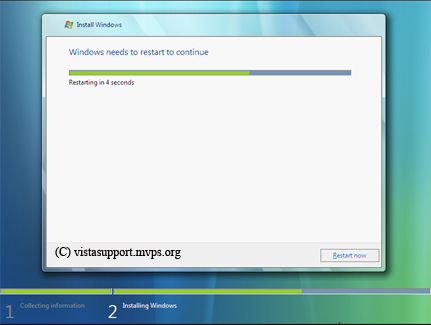 15/ Windows Vista will now start to install. You can instantly see the installation progress as files are copied, expanded and installed. 16/ After the files have been installed your PC will need to restart. 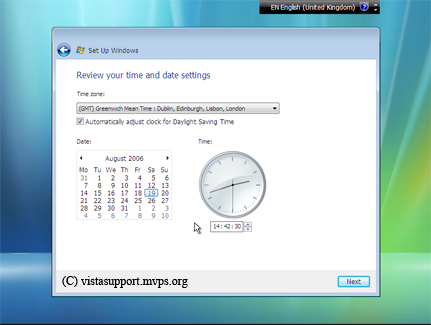 You can either allow Windows Vista to automatically restart your PC or, alternatively, you can press the Restart Now button on the Windows needs to restart to continue screen. 17/ Your system will now restart. 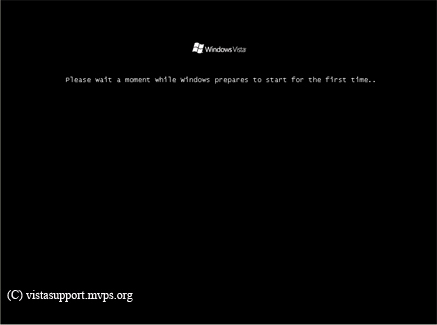 18/ After restarting you will be asked to wait a moment while Windows prepares to start for the first time. This may take a while. 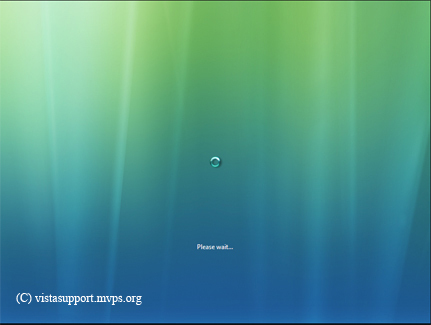 19/ The next screen you should see is a please wait screen. 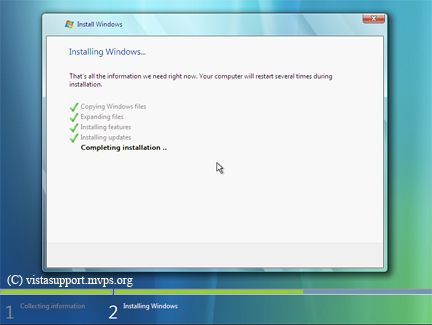 20/ After a short period Windows Vista continues to install the installation files. After it finishes your PC will restart again. Please Note Currently there is no warning of this restart, so don’t worry if the screen goes blank and the PC restarts on its own. 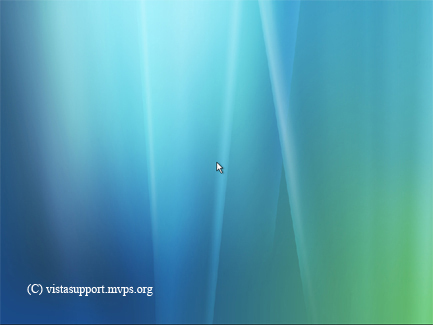 21/ After restarting the progress bar appears again before Windows Vista starts asking for user details. 22/ The first user detail screen asks for your name, password, and picture. Type your user name, followed by your password. You will also need to confirm your user password. After this has been completed you may select a picture of your choice. If you don’t want to change the default picture simply press the Next button. If you want to change the picture, simply highlight the new picture you want and then press the Next button. 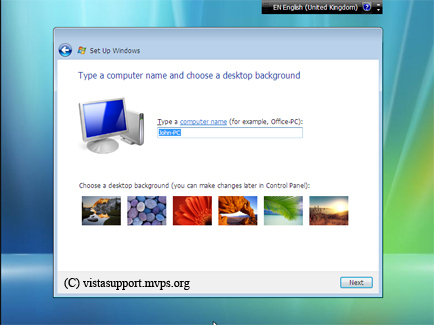 23/ The next screen allows you to choose a name for your computer and also to change the desktop background. Type the name of your computer and then click on a suitable background picture (unless you prefer the default one) and then press the Next button. 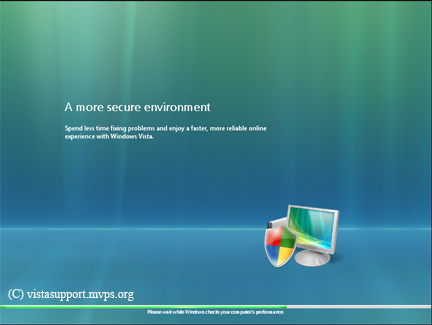 24/ On the next screen you have the option of selecting how you will deal with updates, firewall etc. It is wise to click the use recommended settings option and then press the Next button. You can make changes to the security settings, if you wish, after installation has finished. 25/ Now review the date and time settings and make any necessary adjustment. Press Next after completing this screen. 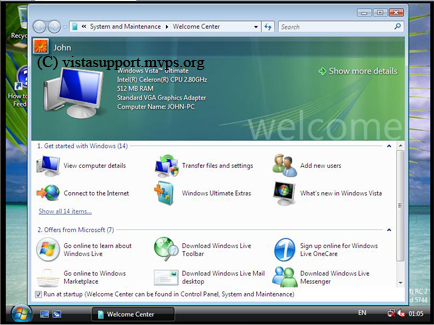 27/ Prior to Windows Vista starting, the operating system first needs to check your system performance. 28/ As performance tests are being carried out a sequence of around 6 windows like the one above will appear on screen. 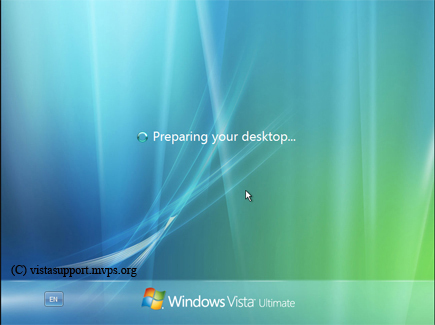 29/ Each screen gets you nearer to your ultimate aim, the Windows Vista desktop. 30/ The sequence of these screens may repeat depending upon how quickly they appear. 32/ Just a little bit longer. 33/ At last! 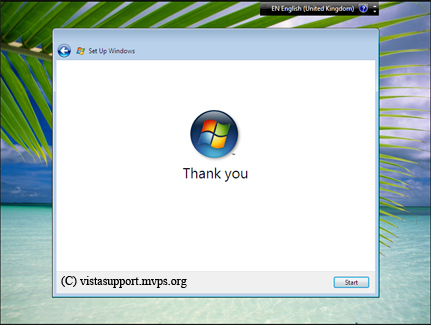 The performance check is finished and Windows Vista is ready to start. 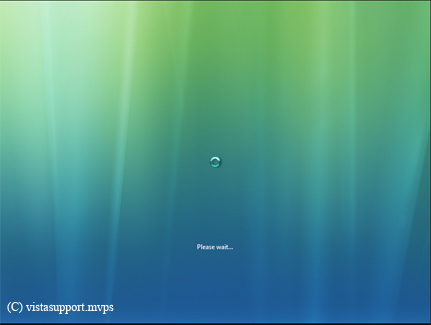 34/ Windows Vista is now loading. 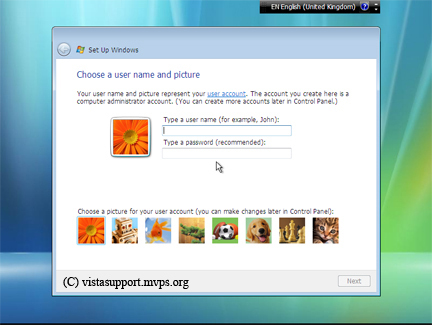 35/ Type in your user password and then press the Arrow button to the right of the password dialogue box to log on to Windows Vista. 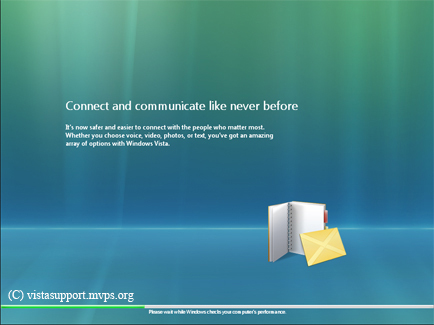 36/ Welcome To Windows Vista. 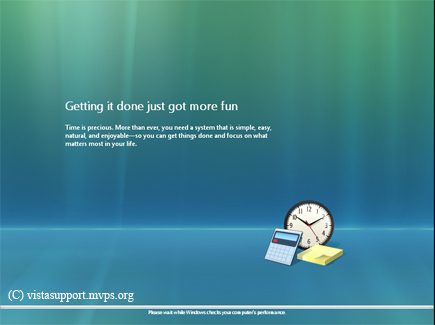 37/ Windows Vista is now preparing your desktop. This is the last hurdle. 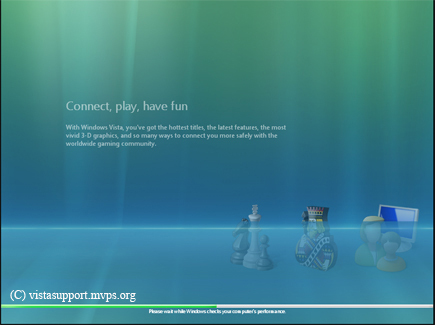 38/ Congratulations you have now arrived at the Windows Vista desktop!